Here at hog roast machine hire London we don’t just offer outside catering for your party; we offer you hog roast machine hire in Twickenham for your party. Rather than hiring us for the full package at your party we now rent our hog roast machines out so you can have a go at doing it yourself. This is becoming more and more popular because if you have used our service before people are beginning to realise how good it is to hire a hog roast machine in Battersea is and that it actually doesn’t seem that hard to do. And it really isn’t. Hiring one of our machines is one of the most simple and hassle free ways to cater for any event whether it is a business conference in Twickenham Stadium, a charity fund raiser for Battersea Dogs Home or a christening in Uxbridge. Hog roast machine hire in Uxbridge is suitable for all occasions. The idea of having a fund raiser day at Battersea Dogs Home with different stalls and games is the perfect way to make money for a good cause. And what better way to make some money than selling delicious hog roast sandwiches to everyone at the event. These kinds of events always have homemade cake stalls or traditional food stalls so why not steal the show and offer succulent and freshly made hog roast sandwiches for everyone to enjoy. If you get in touch with us and tell us how many people you need to cater for and what your location is then we will provide the perfect machine for you. One of the best things about our machines is the freedom that they give you; it doesn’t matter whether you’re inside or outside our machines are easily moveable and can be located anywhere. Once you have told us your details we deliver your machine to you personally and provide you with a set of instructions in order for you to set it up properly. It is a lot easier than you may think and if by chance you do encounter any problems we give you the contact details of one of our trained hog roast chefs who will be on hand to help you. Using one of machines for the catering at a charity event will be an experience that you and your guests will never forget. The food that you cook will taste like it has been prepared by a top chef. All your guests will be begging for more when they see your delicious hog roast slowly pinning on the spit. This kind of cooking process not only creates good food but it also creates spectacular theatrics. The sight and smell of a hog roast cooking is a unique experience that will really whet the appetites of everyone. Also there is no limit on what kind of meat you want to cook. All kinds of meat can be cooked on our machines and the end product will always be delicious. One of the most important things to take into consideration is cost. Would it be cost effective for you to hire a machine and do it yourself rather than hiring us to do the catering for you? The answer is yes. Just as cheap as any other form of catering on the market and if you are using it for a charity event then you have the freedom to charge what you want for the food you are serving. We also include delivery and collection anywhere in the capital in the price. It is easy to see why Hog Roast machine hire is quickly becoming one of the most popular forms of catering in the country. With so many people searching for delicious and simple food for their event one of our machines is perfect. And one thing that many people like to do is show off their cooking skills. What better way to impress your guests than providing them with the finest cooked meat available on the market today cooked by you. 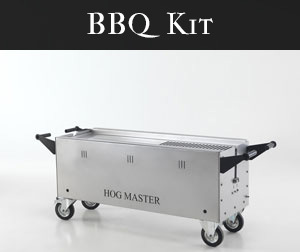 It is easy to set up, provides mouth watering food and is very affordable, so get in touch and order your hog roast machine today. Have you ever thought about becoming a professional hog roaster for the day? Imagine at your next event wowing your guests with the smell and the taste of a full pig roasting slowly in the corner as you chat over drinks. Have you ever considered generating extra revenue for your pub or restaurant or maybe you are having an event at your business and would like to offer your guest something a little different in the way of catering. Maybe you work for a charity and would like a fun and tasty way of rising funds at your next function or maybe you’re a budding entrepreneur and have spotted a gap in the market and you want to sample some of our equipment. Well now thanks to Spitting Pig London you can, we offer our hog roast machine hire on a weekend, weekly or monthly basis. 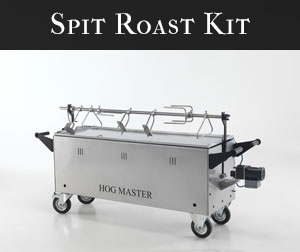 Our hog roast machines have been developed over the past 25 years and are now considered industry standard equipment for hog/spit roast events. Cooking on a spit is now an extremely fashionable method of cooking and we have glowing endorsements from a wide variety of celebrity chefs who loved using our spit roast equipment. All our machines are fully CE registered and comply with industry standards; they are light and come with 4 outdoors wheel making getting the machine into position for event effortless. They tackle tough terrains with ease and are perfect for squeezing into tight spaces as the machine can be broken down and re-assembled with just a few bolts. All our machines are fully stainless steel which makes them look fantastic as well as being easy to clean. We have included a glass viewing panel so all your guests can watch as the pig slowly cooks in its own juices. However what really sets our machines apart is there ease of use and their ability to produce perfect results time and time again, it couldn’t be easier. 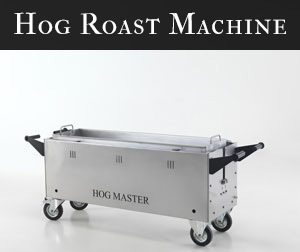 When you book in the hire of one of our hog roast machine you get the complete service. One of our specially trained hog roasting experts will deliver the machine to your door at a time to suit you. We will supply the gas to power the machine free of charge and if you like we can even provide the pig. We will then give you a demonstration of how best to use the machine for your event. This will include lots of handy hints which will help with serving your guest, getting the tastiest and crispiest crackling and making sure your food is every bit as spectacular as you imagined. We are contactable throughout your event, even at weekends to ensure if you have any questions or need some advice then we are only a phone call away. Once you have completed you event we will come and collected the machine again at a time to suit you. It couldn’t be simpler, so why don’t you give us a call today and start a hog roasting adventure that is sure to leave the guests at your next event speechless.